I finally found the time to work on these updates/bugs, and with that I’ve gotten far enough on this project that I felt comfortable “officially” released BakersCalc into the wild (well, at least to reddit). There’s still a bit of work left, but I’m confident that what is up now can hold on it’s own. Big update! 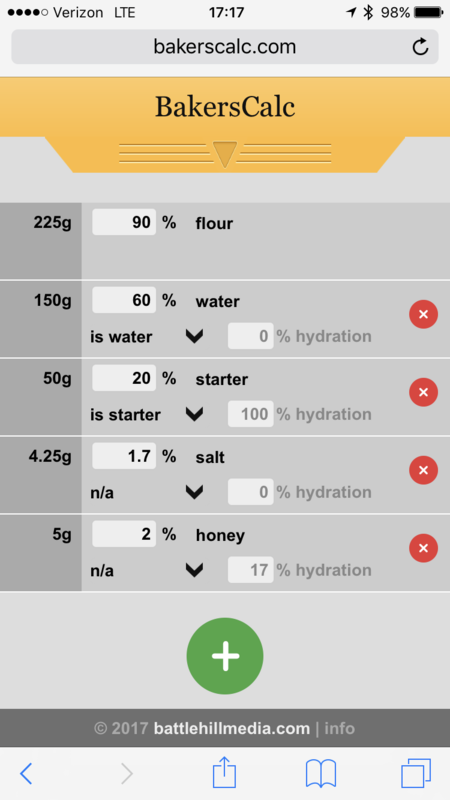 In this version I’ve implemented the ability to define multiple flours, calculate item hydration, starter hydration, and squashed some bugs. I’m glad you asked! BakersCalc is a side project of mine to help with creating, updating, and sharing bread formulas. The beauty behind baker’s percent is everything is relative to your total flour weight, so it doesn’t matter if you want to make 300g of dough or 300kg. All your ingredients will scale accordingly.